The 34th Carole Nash International Classic MotorCycle Show takes place on the weekend of April 26-27 and along with the man himself, both the MV Agusta and Ferrari that took Surtees to two- and four-wheeled world championship glory will be in attendance. 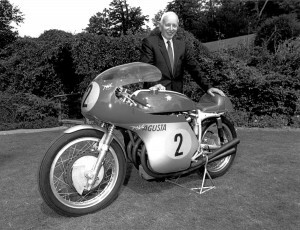 James Robinson, editor of the event’s title publication The Classic Motorcycle, said: “What John achieved in both bike and car disciplines is remarkable. “He is a real master of machinery and it’s a great honour that he’s chosen to come to Stafford and grace us with his presence. Surtees won’t be the only big name new to the show this year though, with former racer and current motorsport TV personality Steve Plater taking the reins from the retiring Dave Craggs as show compere and commentator. Plater will be on stage regularly throughout the event talking with the guest of honour and presenting awards, and show manager Nick Mowbray said he was delighted to welcome the former British Supersport champion into the fold: “Steve has been at several of our events in recent years and it’s fantastic that he is coming on board as compere for Stafford. It’s not just special guests that’ll be welcomed either, as rows of stunning display machines showcase the very best that the classic world has to offer. Top billing will perhaps go to the one and only Moto Major, an incredible looking, one-off machine built by Italian Salvatore Majorca in 1949 – it’s a bike that has never been seen in the UK before. 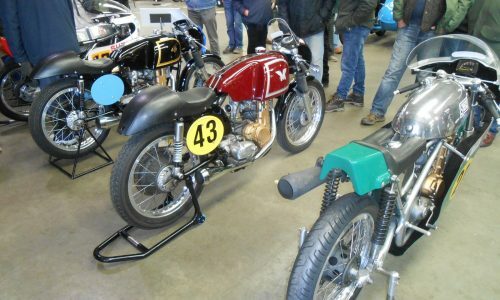 James Robinson added: “I’m looking forward to getting in among the private entries and display bikes to see what gems are at the show. 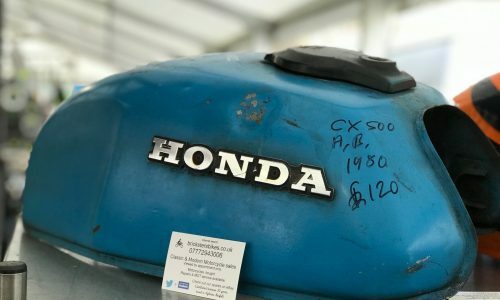 The event will also feature numerous halls packed with traders, manufacturers and autojumbles, and there is live action in the form of the world famous Wall of Death. Advance tickets for the 34th Carole Nash International Classic MotorCycle Show are on sale now from www.classicbikeshows.com, or can be purchased over the phone by calling 01507 529529 – with an advance one day adult ticket costing £10, a £3 saving on the gate price. The show is open from 9am – 6pm on Saturday and 9am – 5pm on Sunday. Parking is free.